In 2011, Tom Evslin of Stowe learned he needed a stent to open a blocked coronary artery. The entrepreneur, whose latest venture is natural gas transporter NG Advantage, considered going out of state for the procedure. Evslin came away with a new understanding of how fostering cutting-edge medical research at a facility like UVM's helps attract and retain "stars." He also learned that finding funding for that sort of research is a challenge. "I had a stent put in that saved my life," Evslin says. "I wanted to support research and help retain the good people in the group." So he proposed a competition to Schneider with a $1 million prize donated by himself and his wife. Nine medical researchers from UVM submitted one-page summaries of their work on heart care to the Evslins. The couple selected three to give 20-minute talks to them at UVMMC. "It was just us," Evslin said, explaining who judged the presentations. "That made it a premium to be able to speak to laymen." All of the research sounded promising, but Evslin took a special interest in Dr. Peter Spector, a cardiologist heart-rhythm specialist and UVM medical professor. Spector described his investigation of a new treatment for atrial fibrillation, a common heart-rhythm irregularity. 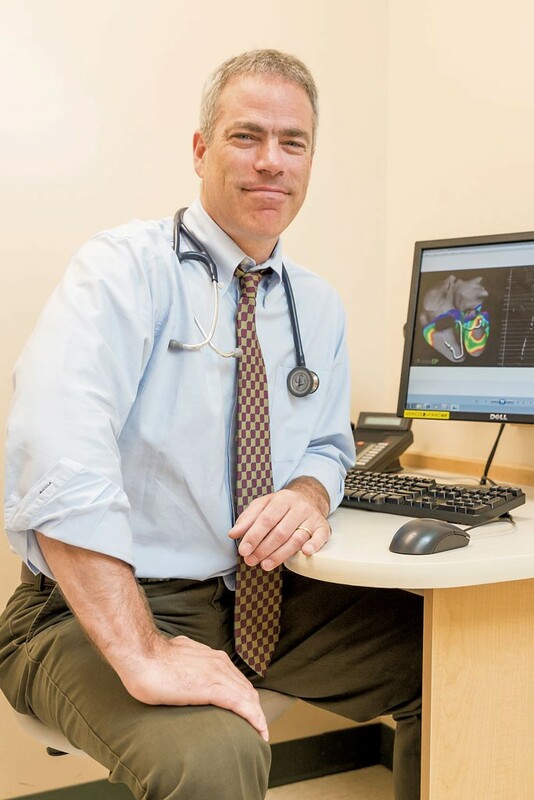 Spector had been studying atrial fibrillation since 1999 and believed he had made a breakthrough in understanding its causes and how to target and neutralize them. But he was running out of research money, and his work hadn't progressed enough to attract investors. Just when he wanted to double down on his research, he faced increased pressure from UVMMC to see more patients. "My brother has A-fib, and other people I know do," Evslin says. The couple was looking for a project that was a long shot with big potential. Spector's ambitious one fit the bill. "My life changed that day," says Spector. That was four years ago. The Evslins made their gift in four payments, buying Spector time from his cardiology practice to devote to research. The grant also allowed him to hire a team to help — several biomedical engineering doctoral students and physician scientists. "It went from me by myself to [all] of us churning away," he says. The result: Spector and his team have come up with a mapping system so promising it could enable doctors to cure atrial fibrillation, which affects millions of Americans. "Even if this leads to only a 10 to 20 percent improvement in the cure rate," Spector says, "that could impact 250,000 to 500,000 people in the U.S. alone." Spector, in a short-sleeved shirt and slacks rather than scrubs or a white coat, sits at his desk in a small office within the hospital's cardiac clinic. His skills as a professor show as he pulls up a colorful image of a heart on his computer and uses simple-to-grasp analogies to explain A-fib to a reporter. Normally, a wave of electricity spreads from the heart's pacemaker cells first across its upper and then its lower chambers, telling the organ to pump, he says. The electrical signal is like a column of race cars driving down a track in a tight pack. In atrial fibrillation, that signal "is more like a whole bunch of cars doing doughnuts in a parking lot," Spector explains. Typical symptoms are feelings of anxiety, agitation, breathlessness and lightheadedness. "It makes people feel pretty miserable," he says. The condition is more than just uncomfortable. The chaotic electrical activity fails to stimulate strong pumping action by the heart. As a result, blood may pool, potentially forming a clot. If a clot breaks loose, it can migrate through the bloodstream to the brain, block an artery and cause a stroke. While medication can help, it works for only 45 percent of patients, Spector says. A second option is a procedure called catheter ablation. A catheter is threaded from a vein in the groin to the heart's upper chambers, where it targets several prescribed locations with heat. Because the resulting scar tissue doesn't conduct electricity, it extinguishes the erratic cyclones of energy. The problem with this procedure is that it's "blind," says Spector, who performs about 100 ablations a year. Rather than drawing on information about a particular patient's heart, "We go to the same places in everybody," he says. When it works, blind ablation can be considered a cure. But Spector says the procedure produces disappointing results for many patients with persistent A-fib. Hence his solution: a mapping system that identifies specific areas to treat in an individual heart. Bonnie Dattilio is one of the lucky ablation recipients, although her "cure" wasn't immediate. The Essex Junction resident recounts how one night her heart just seemed to go crazy. "It feels like you are on a roller coaster," she says. "It is a terrible feeling." Dattilio thought she was having a heart attack, but in the emergency room she learned she was experiencing atrial fibrillation. Like most new A-fib patients, Dattilio received medication intended to control her wild heartbeats. "It worked for a while," she says, but, after three years, she found herself stricken without warning. "Every time it would happen, I would have to sit down," she says. That made it difficult to teach dance — her work and her passion. Dattilio had danced on Broadway and in Las Vegas for 13 years before coming home to Vermont to open a studio and to teach dance at UVM, which she has done for 20 years. When the chaotic heartbeats came on, they could continue for hours; episodes sometimes occurred more than once a day. "You never knew when it was going to strike. I could be doing nothing," Dattilio says. She tried to figure out triggers, but, other than giving up alcohol, she found nothing made a difference. "It wasn't anything I ate, or exercise." Dattilio was game for the ablation because, she says, "If you can not be on medication the rest of your life, that is better." Spector performed her ablation in March 2014. The heat treatment failed to destroy some areas of targeted tissue completely, leaving gaps in scar barriers that allowed the atrial fibrillation to recur. That's common, says Spector, who repeated the procedure last December. "I have had no episodes since then, so they think it is fixed," Dattilio says. "Now I can dance," she adds. "It is the most wonderful feeling when you wake up and it is fixed." Spector's new mapping procedure might have made that second ablation unnecessary. But his big fix still has many steps to undergo before it can be used on human patients. His studies using pigs "have been extremely successful so far, matching the computer modeling perfectly," he says. Spector has worked with the UVM Office of Technology Commercialization to develop eight patent applications for aspects of his work, including specialized catheters and signal-processing algorithms. Two have been granted; the others are pending. Such patents make research valuable to private companies. Spector has attracted the attention of Biosense Webster, a California-based subsidiary of Johnson & Johnson that specializes in catheters and mapping devices used in the diagnosis and treatment of cardiac arrhythmias. The partnership that evolved is technically a contractual agreement between UVM and Biosense, explains Corine Farewell, director of the commercialization office. Under the agreement, Biosense sponsors Spector's laboratory, she says. UVM grants the company a license allowing it to incorporate Spector's intellectual property into its products. Biosense will also coordinate the human testing that could start next year with a 10-patient feasibility study at UVM Medical Center. If it happens, that study will be Spector's only opportunity to perform the treatment before it receives federal approval. Obtaining that approval entails conducting subsequent randomized trials at other locations for at least three years. Spector acknowledges the frustration he'll experience while his procedure is in testing: "I can't use my own system." But, he says, an unbiased assessment is key to securing approval from the U.S. Food and Drug Administration. In the meantime, Spector has other ventures. In 2013, he founded a company, VisibleEP, that markets computer models to teach medical students and doctors about heart-rhythm disorders and their treatment. The tools are an outgrowth of the computer models Spector developed to improve the mapping of atrial fibrillation. He also has a new project of figuring out how doctors can more accurately assess the success of the heat treatment used in all kinds of ablation procedures. Applying too much heat can damage tissue outside the heart. Using too little can be ineffective. Developing a lesion-assessment tool "will be a critical step in improving the execution of A-fib ablation," Spector says. For Spector, all those initiatives have the same goal: a procedure that works. Evslin and his wife have received regular updates and cheer the progress Spector and his team have made because of their million-dollar gift. "It has proceeded more quickly, and the results will have broader application, than we imagined," he says. The original print version of this article was headlined "Rhythm Methodology"